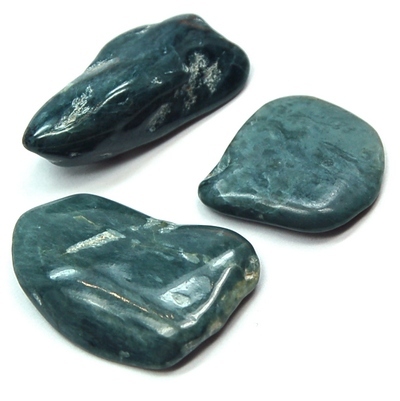 Contributing serenity and harmony in any situation, Blue Jade can help with emotionally charged issues. In general, Jade is said to be a stone of wisdom and can be used to help one approach a situation from a different perspective. Using Blue Jade will help to still the mind which allows one to see solutions where they couldn't be seen before. Many use Blue Jade to help achieve slow progress in a situation that originally seems insurmountable. Another benefit of using Blue Jade is the finding ability to accept and find peace in those issues that cannot be changed, so that you can release them and move on. Blue Jade can be used during meditation to either bring your subconscious to a floating state in the sky, or to a deeper, calmer state of being in the peaceful ocean depths. Blue Jade can bring deep spiritual knowledge from the unconscious higher self into one's waking consciousness, via communication from the Crown and Third-Eye Chakras down into the Throat Chakra. Wear or carry Blue Jade to help with issues needing your focused attention. Blue Jade can help end confusion, bringing clarity of mind and inner peace. Click here to see Blue Jade in our online catalog. Affirmation: I am pleased with the steady progress of my spiritual growth. Question: Do you have any items that you consider to be "lucky charms"?